Car washes come in several styles, including self-service and drive-in varieties. Most people know how the former works — you park, insert change in the machine, and start scrubbing — but what about the latter? 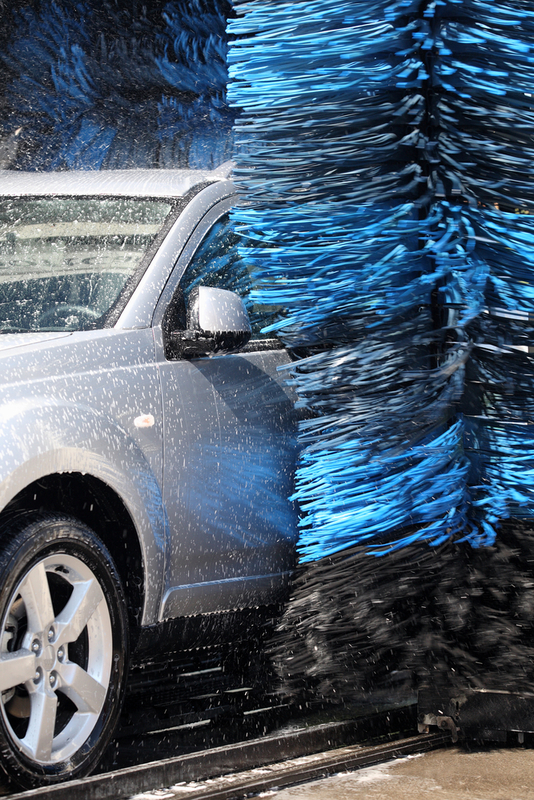 Take a closer look at how the typical drive-in car wash works to gain a better understanding of how it conveniently and efficiently cleans your vehicle. Automatic car washes can be broken down into two categories: touchless and cloth friction. Touchless washes involve a combination of strong detergents and water from high-powered jets, both of which are the only things that make contact with your car. Cloth friction systems use many of the same components as well as fabric strips that scrub portions of your vehicle. Once a vehicle enters a car wash, it will move through the system on a conveyor track or remain in place while the machinery maneuvers around it. Infrared sensors will send signals to the digital control system within. What happens next will vary depending on the equipment, but most include a presoak to loosen dirt and prepare the vehicle for detergent application. Separate nozzles will spray the tires, and a curtain made of long strips of soft cloth will gently brush the car's horizontal surfaces. A mix of chemical cleaner, water, and air make up the detergent in the foam applicator, which gets the deep-cleaning process underway. Rapidly-rotating scrubbers will take care of the vehicle's vertical surfaces, and a high-pressure water blast will complete the scrubbing portion of the journey. The remaining residue will be removed when the car goes through a rinse arch, and a wax arch will follow to apply a water-resistant coating. The automated process will end with a dryer that sends hot blasts of air over the vehicle’s surface. There might be attendants to remove excess water with towels, and your car even could be treated to a handy touchup. Residents of Wailuku, HI, turn to Uptown Chevron Food Mart & Car Wash for quick and thorough car wash service and many other conveniences. From a gas station to a fully-stocked convenience store, this family-owned business has everything you need in one place. Visit their website to learn more about their services, including the tasty selection of food at their restaurant, and call (808) 244-0869 to speak with a staff member.